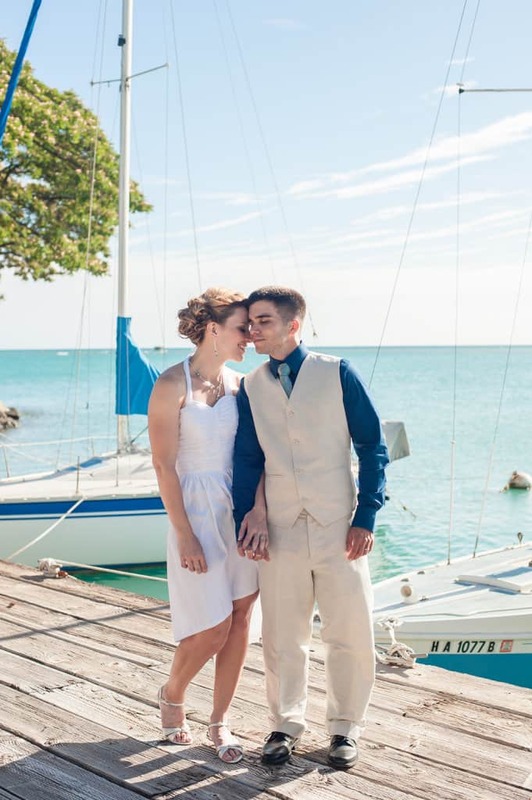 Beach weddings will always have a special place in my heart. I love how they can be casual or chic, rustic or more polished, tropical or Down East. 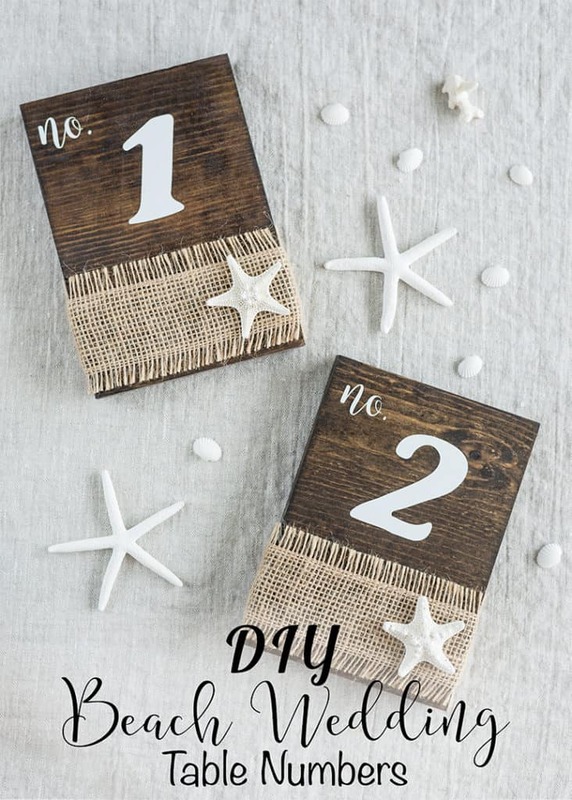 If you’re planning a beach wedding and looking to DIY some of the decor, I hope you enjoy this tutorial showing how to make your own beach wedding table numbers! They’re cute, relatively inexpensive, and easy to customize with your favorite color of paint/stain and shells. And just because I can’t resist sharing, before we get into the tutorial I have to show this picture. It’s still one of my favorites from our wedding day! I realize that lots of people don’t have access to vinyl cutters and power tools, so don’t worry – this tutorial has plenty of suggestions on how to make the wood table numbers even if you don’t own the equipment I used! Grab a paint pen/maker and paint the number on. 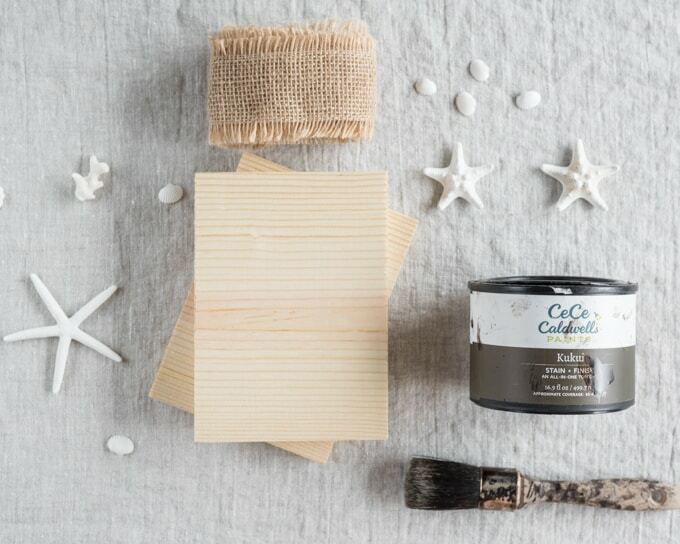 Head to a craft store, pick up a set of number stencils, and use them to paint. Hand cut vinyl numbers. This site has a good post on cutting vinyl by hand. Look for stick on or dry rub numbers that are already cut. My numbers are just under 2.5″ high – anything from 2-3″ could work. There are several options on Amazon. You will also need the ability to cut down a board. We used a “sliding compound miter saw.” Unfortunately, as much as I want one, we don’t have one! What we do have is access to a local Makerspace. Makerspaces are places where people can learn about and use a variety of tools, so they’re a great option if you have a DIY project you want to tackle but don’t have the tools you need. Check to see if there’s one near you! Or, of course, you can ask around and see if any of your friends or family has a saw you can borrow. If you can’t find any other way to cut your board, you can ask the store to cut it for you when you purchase it. The problem with this is that their blades are frequently very dull, which makes it more likely the wood will splinter, and they don’t always make very precise cuts. You might end up with perfectly fine pieces this way, or you could end up with splintery pieces that are all slightly different sizes. An 8″ wide board. To figure out what length you need, please see the explanation below! Vinyl and either a vinyl cutter, a plan to cut by hand, or one of the other options discussed above. Make sure you have permanently adhesive vinyl! I prefer matte white vinyl. Something to protect your work surface – wax paper, an old box, etc. Sandpaper – optional, but useful if your wood is rough or splinters while being cut. To determine how much wood you need, figure out how many table numbers you need. The finished table numbers are approximately 7″ high by 5″ wide. Because of how boards are measured and processed, an 8″ board is actually about 7 1/4″ wide when you buy it, so all you need to do is make cross cuts every 5″! Unfortunately, each board is also a bit shorter than advertised, so check the tag at the store for the actual length or bring a tape measure. Additionally, each saw cut will take about 1/8″ of material. To find how much length you need, multiply your desired number of table numbers by 5.125. Divide this number by 12 to get the number of feet needed! For example, for 10 table numbers, you’ll need 4.27 feet, so get a 5 or 6 foot board. For 20 table numbers, you’ll need just over 8.5 feet, so you’ll probably end up purchasing a 10 foot board. Try to find boards that are flat and don’t have any big gashes, spray paint marks, etc. I’ve found “clear pine” is usually the best for these table numbers – it’s inexpensive, but a little nicer than the absolute cheapest boards. 1. 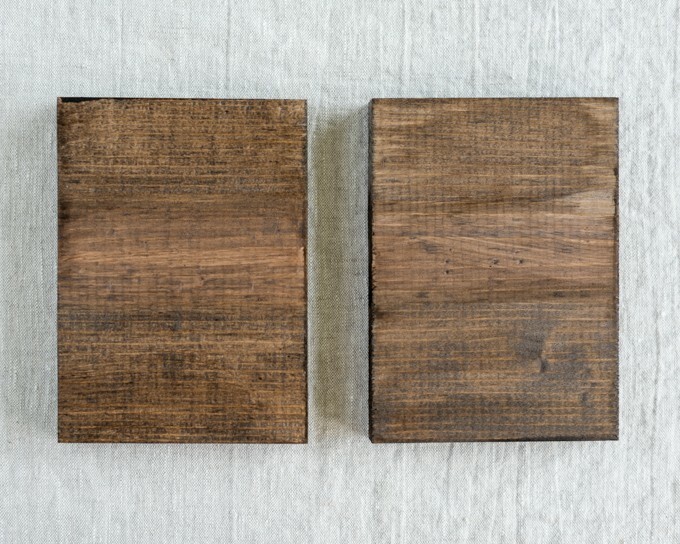 Cut your 8″ board into 5″ wide pieces. Because the board is actually about 7″, this will give you nice looking 5×7 table numbers! Cut as many as you need. 2. If needed, sand down any rough edges or spots. 3. Protect your work surface and get staining! Of course, you can use paint, if you’d prefer. Follow the directions on your stain or paint – some stains require you to wipe off excess stain after a few minutes. I highly, highly recommend you check out Cece Caldwell’s stains. I order from The Glitterfarm and they have super prompt service. I am not an affiliate, I just love the product. After years of working with toxic, stinky stains for projects, I was so happy to find these low VOC choices! 4. While you paint/stain is drying, you can prep your numbers. If you’re cutting them by hand, you may want to space the project out over several days. Whether you’re hand cutting or using a machine, after you’re finished cutting you’ll want to “weed” the vinyl. Because my vinyl is white on white, this doesn’t photograph well so I don’t have a picture, but simply use tweezers to remove all the vinyl you don’t want on your finished project. You only want the number and “no” left on the backing if you’re using my cut file. If you haven’t already, you can snag the free cut file here. 5. 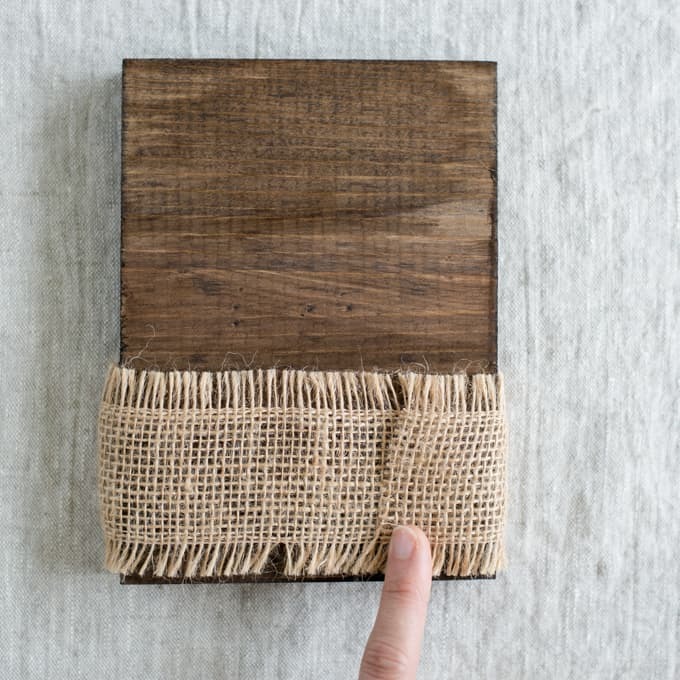 Once your stain is completely dry, cut pieces of burlap ribbon so they wrap all the way around a short edge of the board with a half inch or so of overlap. 6. Heat your glue gun! 7. Position your burlap so that the overlap is towards one side or the other. 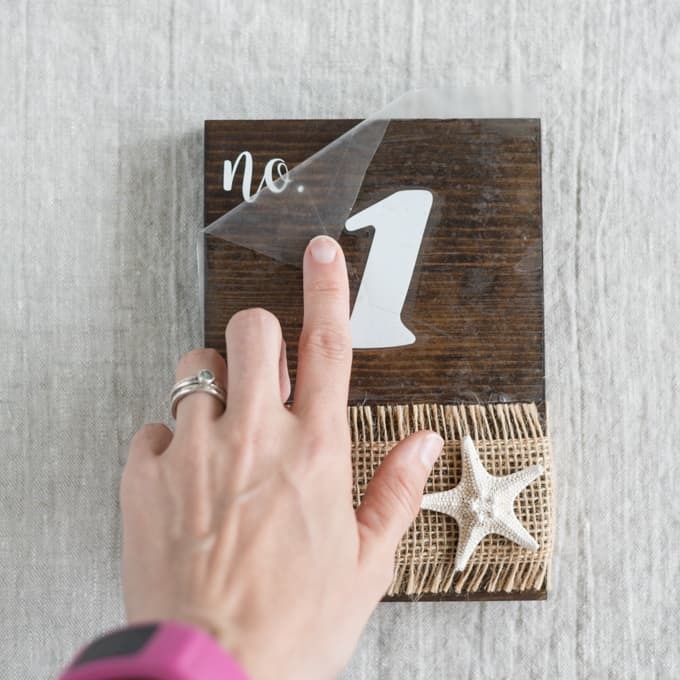 If you’re making double sided table numbers, make sure the overlap is approximately where you’ll want to glue your starfish/shell. You’ll be able to conceal it a bit with your starfish! 8. Glue the “underneath” piece of burlap down. You only need to glue along the cut edge, not along the entire piece of burlap. Allow the glue to cool a little. 9. 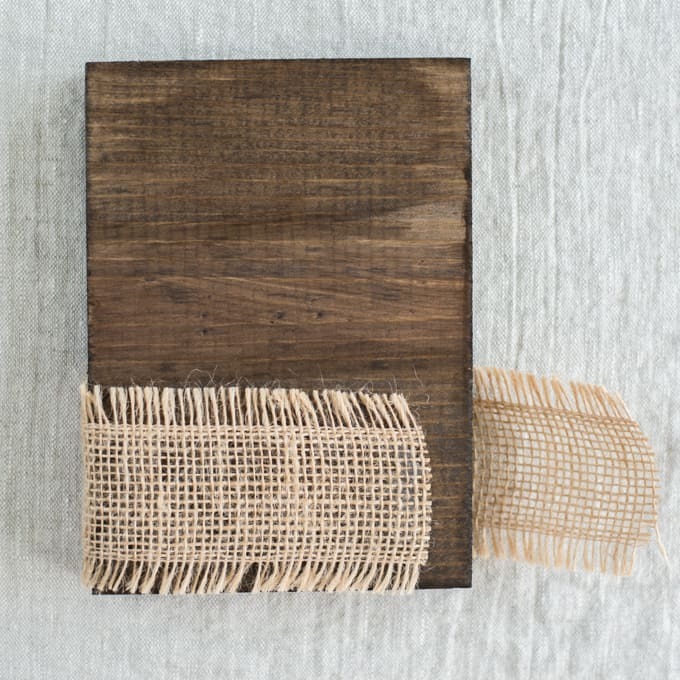 Once the glue is cool, pull the burlap snugly around the table number and glue the upper portion in place, as shown. Again, you only need to glue along the cut edge. Cut a piece of transfer tape down to about 5″ x 3″, or whatever allows you go completely cover your numbers and any additional text with some extra around the edges. 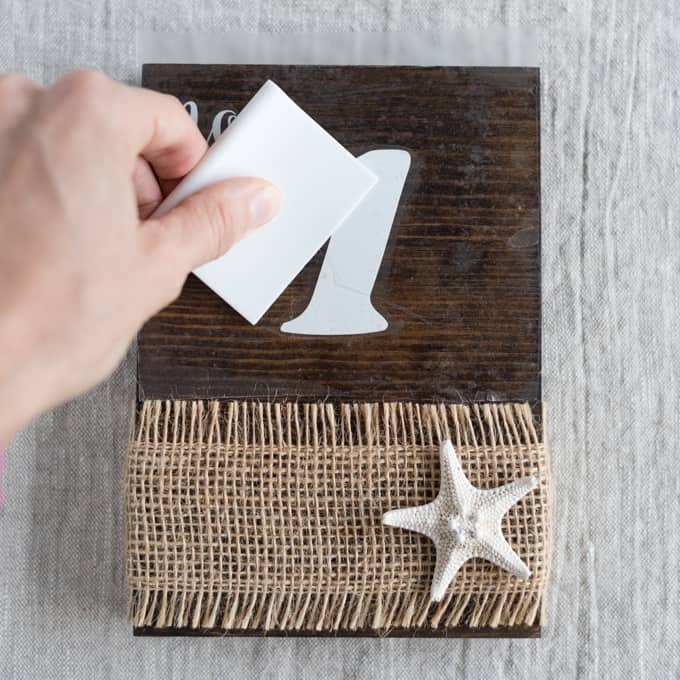 Use a scraper, or just an old gift card, to firmly rub the contact paper down so it sticks to the vinyl. Carefully peel the contact paper up, bringing the vinyl along. Sometimes you may need to help the vinyl up with a pair of tweezers. Position the contact paper on your board so the text and number are where you want them. Carefully peel the contact paper back. Use your scraper or tweezers to help, as needed. Carefully burnish the vinyl a final time to make sure it’s secure. 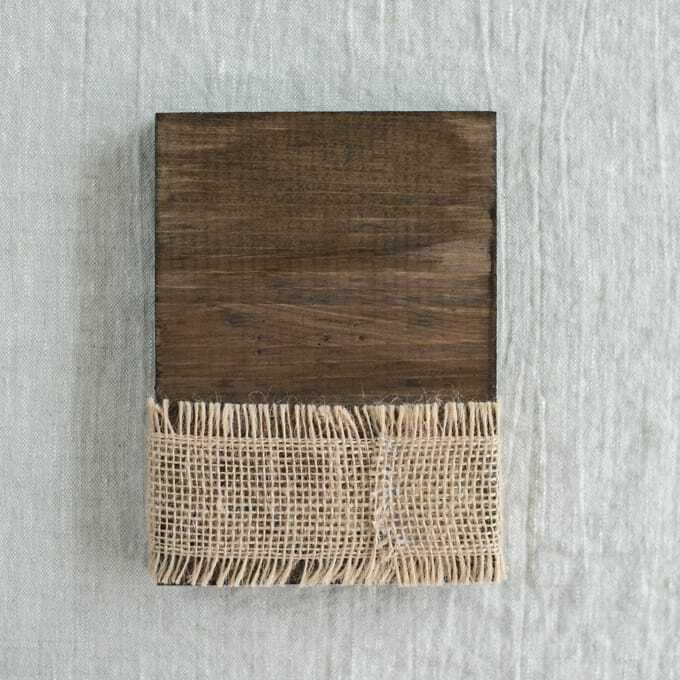 You can see more pictures of the process in this post about making your own mini pallet art. 11. Add your starfish, shells, or other decorations. 12. Repeat steps 10 & 11 as needed. 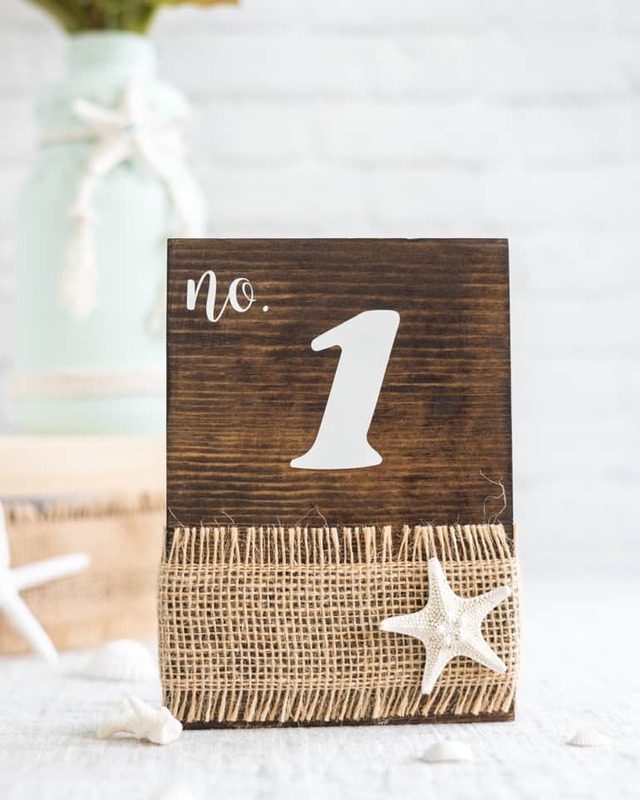 Enjoy your beautiful beach wedding table numbers! If you make these, please post a picture to social media and tag me @natashalhn on IG, @natasha5887 on Twitter. 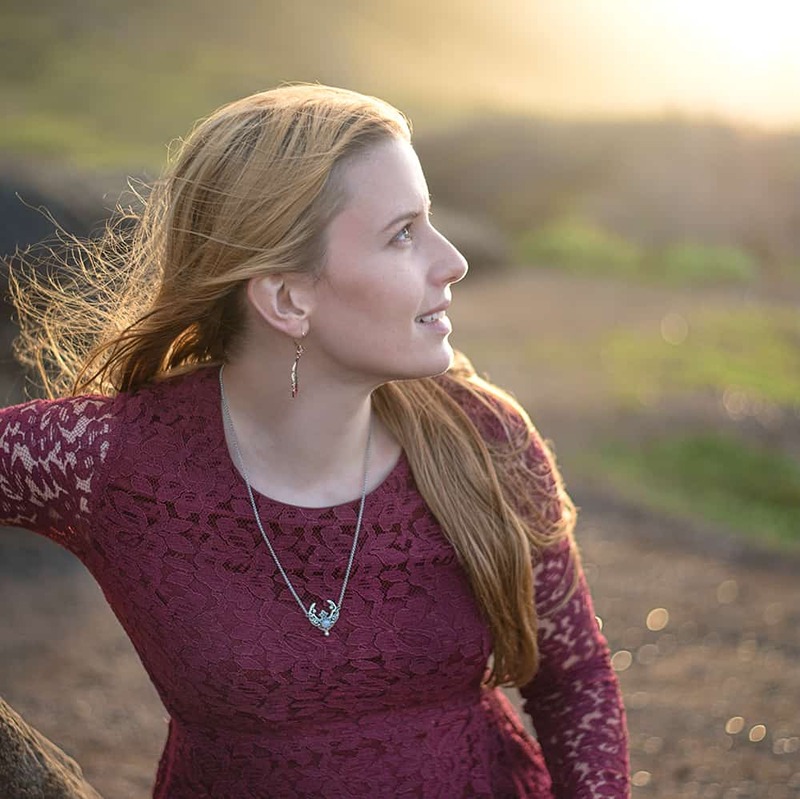 I’d love to see your creations!! What other DIY wedding resources would you like to see? So rustic and beachy! I love this aesthetic. These look fab Natasha! I love the rustic look of them.